Do you ever get an intense craving for something? Do you ever feel like you have to have something, and you have to have it right now? Most of the time you can indulge your hankering right away, swinging by the supermarket for a Snickers or meandering into town for a mini shopping spree. But other times, your craving is a little more complex. It requires work. This presents a dilemma. Do you really want to go to the effort to make something for yourself? Do you want to get down the flour, pull the measuring cups from the cabinet, and preheat the oven???? Oftentimes, my laziness wins out, and I am left with a grumbling stomach and a cloud of grumpiness floating over me. But on those glorious occasions where I have a spurt of energy (or when you have to bake for someone else), I am rewarded and unbelievably satisfied. Since I arrived in Scotland, I feel like I've been a little devoid of fruits and vegetables. Potatoes for breakfast, potatoes for lunch, potatoes for dinner. Don't get me wrong. I love potatoes as much as the next person, but a girl cannot live on potatoes alone. The fruit options are slim- a vibrantly green banana or a mushy apple. Not exactly enticing. At home, I drink tons of water, and I always add a quarter of a lemon to my glass. It is an entirely different story here. Not only do I drink minimal water but it never has lemon in it. What an outrage! My need for a little citrusy kick finally overtook me on saturday. It simply had to be done. 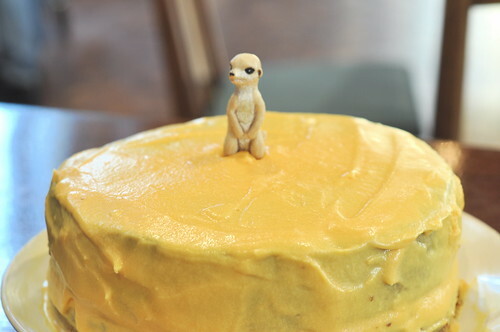 I had to make a lemon cake. Perfect timing, as a friend's birthday was on Sunday. I wanted something a little different than your average lemon bundt cake or 1-2-3-4 cake. It didn't have to be outrageously complicated. It just needed to be tasty. So one of my friends Todd and I walked the 23 minutes to Morrison's in order to gain inspiration. I eyed stems of ginger and packets of dried cranberries, hoping to find the perfect partner for the lemon. I remembered I had run out of brown sugar, and then it hit me. Of course. 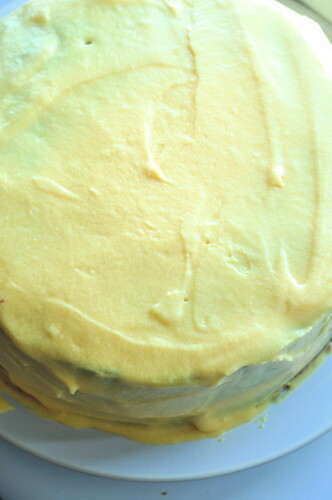 A lemon brown sugar cake! I'm still fiddling around with conversions and getting acquainted with the kitchen here. It ended up being delicious, even if the icing was a little runny. It was a tad on the dry side, but that can easily be remedied the next time I make it. Hmmmm, what am I craving now? Preheat the oven to 350 degrees. Grease and flour two 9-inch cake pans. Whisk the flour, salt, and baking soda together. In another bowl, whisk together the lemon juice, zest, and the milk. 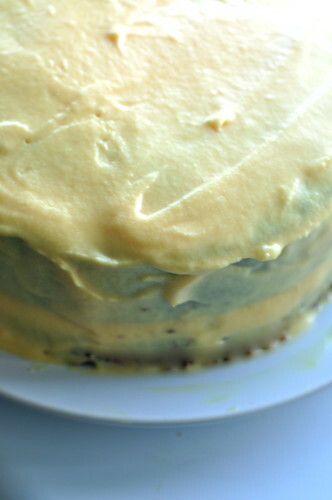 Cream the butter and the sugar with an electric mixer until the mixture is light and creamy. Add the eggs one at a time, beating thoroughly after each addition. Add the flour in three additions, alternating with the milk, and ending with the dry ingredients. Mix until thoroughly combined, but do not over-beat. 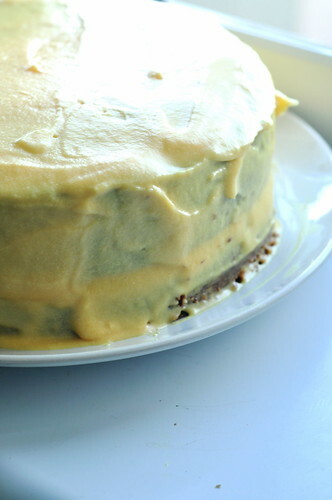 Bake for 30 minutes, or until a cake tester inserted in the center comes out clean and the top is golden brown. Cool on a wire rack. Ice with a lemon or vanilla buttercream (5 1/3 tablespoons butter, 3 cups powdered sugar, 2 tablespoons milk).